LED fixtures by Global Energy & Lighting boost car sales with improved lighting output and uniformity, while reducing energy consumption. Pohanka Automotive Group wanted to deploy a high-performance lighting solution capable of showcasing their vehicles, while simultaneously lowering the energy costs from their current Metal Halide lighting. They were approached by a Global Energy & Lighting sales partner who proposed an upgrade to the their 313 Metal Halide fixtures. Global Energy & Lighting designed and delivered an LED upgrade that not only exceeded Pohanka’s performance requirements, by improving the quantity and quality of lighting, but also provided other benefits such as remedying the issues of light trespass and sky-glow. Global’s GLEDSB fixture is full-cutoff and dark-sky compliant, meaning that no light is directed upwards, unlike the customer’s original Metal Halide lighting where a substantial amount of light was directed into the sky creating a nuisance for neighbors and the nearby airport.The new lighting system resulted in an impressive 72.6 percent total reduction in lighting energy costs. Auto dealerships represent a unique application for LED lighting because of the significant benefit from increased sales due to the improvement of light output, color accuracy, and uniformity which results in a more vibrant display of their inventory. 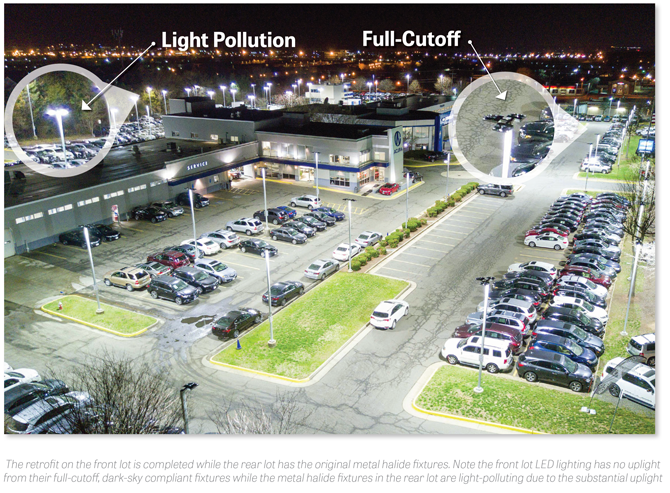 Metal Halide, the legacy lighting system used in most auto dealerships today, experiences color distortion, shifting from a clear white light to colors such as green, blue and pink. This means the lamps may need premature replacement, especially in auto dealership applications where a bright, white light output is crucial for properly displaying vehicles to generate sales. All Global Energy & Lighting fixtures have a minimum 50,000 hour life, more than 10-years of typical use, and maintain bright white light output without color shift. Pohanka’s legacy Metal Halide lighting system operates for 4,320 hours each year. With a typical lamp service life of 10,000 hours this system can only operate for roughly two years before a replacement is needed. Additionally these lamps can lose up to 40% of their light output halfway through their service life, which again means premature replacements are necessary to maintain adequate lighting. It is also important to note that LED lighting can make outdoor spaces safer. LED optical performance is superior to that of Metal Halide lighting, minimizing wasted light, light trespass, sky-glow and glare, which provides enhanced visibility. In addition, LED lighting can restart instantly if there is a power interruption, while Metal Halide lamps may require up to 30 minutes to cool down and restart. At an auto dealership, being in the dark for any period of time translates into lost sales. All Global Energy & Lighting fixtures last for a minimum of 50,000 hours, more than 10-years of typical use, and many of them last much longer. They maintain their color uniformity throughout their service life, delivering consistent bright, white light. Additionally all of Global’s fixtures are UL & DLC Listed, which means their performance is validated by rigorous laboratory tests. These certifications also qualify them for the vast selection of utility rebates available throughout the United States. 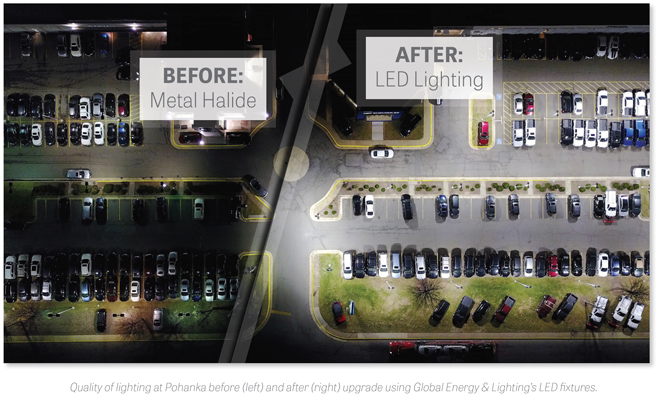 After Global Energy & Lighting upgraded the Pohanka Automotive Group’s Metal Halide fixtures to their industry-leading LED lighting, energy consumption was reduced by 72.6 percent. Maintenance costs were virtually eliminated. More importantly, enhanced lighting translates into increased sales, which is the ultimate goal of any auto dealership.